New users now get a fully interactive walkthrough to introduce them to the most useful features of XC straight away. First timers get to navigate through a project workflow from start to finish in easy steps so they can start their own creative journeys with confidence. Huge improvement - view your Presentations offline! Now you can download your slides to view locally as a single web (html) file. Take your presentations wherever you want, without worrying about a flakey (or non-existent) internet connection. Find the feature on the Download menu - then tap Download Presentation (HTML). Sharing gets a boost - so now a sharer can resend an invitation email even if the document has already been shared - it's simpler just to resend than wading through an inbox! Also - shares can now always open documents from an Email collaborators... notification email even if they didn't accept the original Share editing... email. 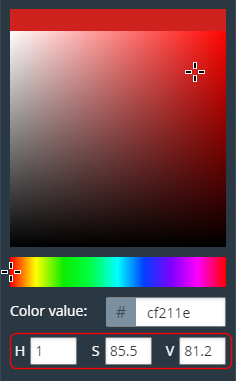 We have added HSV color fields to the color editor for control of the Hue, Saturation and Value color components - this works alongside the existing RGB color system One updates the other - enter a value or drag the targets. We've added a selection of useful Body text fonts in the font picker - popular styles to take some of the hassle out choosing. Find them in the Font section - More Fonts > Body Text. Blue selection outlines rendering incorrectly around text within anchored or embedded groups - fixed. Multiple text selection message handling improved. More new content for August including product sheets, social media graphics, LinkedIn and Twitter posts and a presentation - check them out here and here. Errors caused by symbol replacement in Smartshapes - fixed. Percentage ring smartshape not showing decimal values - fixed.